Peter Brabban at Newcastle Airport with the emergency supplies for Rwandan refugees in Goma, Democratic Republic of the Congo. He travelled with the supplies and a party of journalists to witness the condition of the refugees. LAST YEAR, 82% OF WEALTH CREATED WORLDWIDE WENT TO THE RICHEST 1%. In the same year, 25 million people were in slave labour. Millions more worked long hours on low pay, just to earn enough to feed their families. It’s no coincidence that the worst paid jobs – like making garments and domestic work – are done by women. Inequality is keeping people trapped in poverty, so join us and let’s step up the fight against it. How did an organisation seen by many as a bastion of liberal values end up taking such a determined stance against the economic status quo? Oxfam began its life in controversy by trying to get relief supplies through the Allies’ blockade and into Nazi occupied Greece, where malnutrition was rife. In the post war world, the group of people who had set up the Oxford Committee for Famine relief (later Oxfam – the telex shorthand for the full title) faced challenges way beyond the shipping of relief supplies. It was apparent that grinding poverty was behind every catastrophe. From this realization sprang the grassroots development programmes and projects which by the end of the nineteen sixties accounted for far more of the annual budget than disaster relief. This emphasis on grassroots development brought with it yet more challenges. On the home front the challenge was to present and fundraise for a programme that lacked the urgency of disaster relief while at the same time stressing the importance of the programme. This in turn demanded a way to provide a background and analysis to the creation of poverty in the developing world and how to portray the people living with the reality of deep, structural poverty. Throughout the seventies debate raged in Oxfam about the posters and photo’s they used, the issues they campaigned on, how to campaign and how to present a picture of Third World poverty which provided an analysis of its root causes. They provided support to publications such New Internationalist and themselves published books about the abuse of Third World markets by the pharmaceutical and baby milk industries. By the early eighties there was some frustration at this rather cerebral approach to issues and the campaigns department put forward a radical idea of appointing Campaigns Organisers throughout Britain to take part in grassroots campaigning. In 1984 this debate and transformation came to a head around the appalling famine in Ethiopia and the Horn of Africa. Alongside the donations which flooded in came requests for an explanation of why such tragedies continued to happen and what could be done other than give donations. Oxfam’s response was the Hungry for Change movement of local groups and activists. Behind the movement were publications that clearly put capitalism in the dock. By highlighting the impact of debt repayments, the imbalance in terms of trade, the unfair uses of aid, the disastrous effect of the EUs agriculture policy and how warfare and the arms trade created suffering and poverty. It may not have been Das Capital but it was far more radical than anything which had been generated by the voluntary sector before and it set Oxfam up for a head to head battle with the Thatcher government for the coming decade. Active campaigning by supporters and staff saw the Thatcher government shamed into providing emergency relief to Ethiopia, the highlighting of grain surpluses stored throughout Europe (The Baltic flour mill was an EU grain storage site before it became an art gallery) began the debate which lead to the reform of the EU Agricultural policy, lobbying and campaigning locally and national forced the Tory Government to recognise the government in Cambodia and a diverting of aid funds from the Khmer Rouge dominated camps in Thailand to help with the recovery and development within Cambodia. These successes convinced the managers of Oxfam that campaigning on injustice would be part of the organisations future. 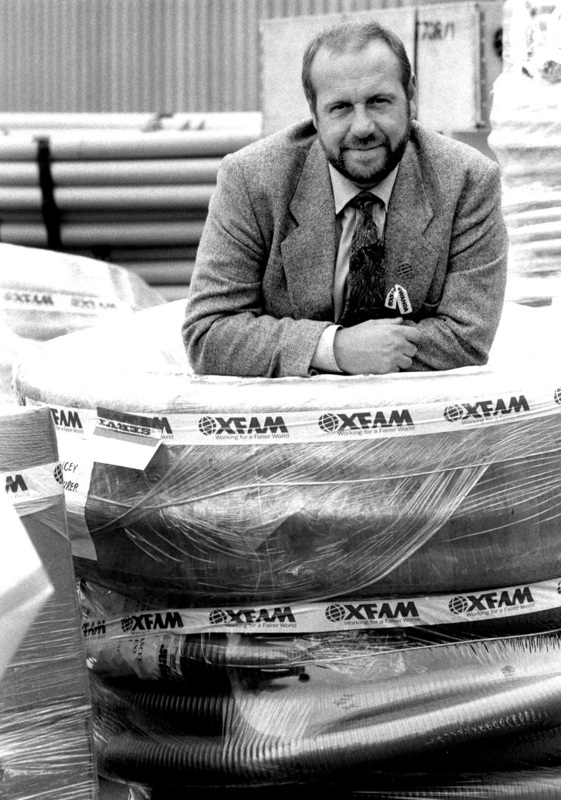 Peter Brabban was the Oxfam officer in the North East in the early 1980s.